The Guardian have a useful column debunking some common folk psychology. Also Scientific American have a good article on temperature trends. The article does a good job of highlighting that it’s not the absolute numbers which are so unusual about recent warming trends, but the speed; last time we warmed up that far, it took over three thousand years to happen. This time it took less than a hundred. Simon Wren-Lewis breaks down Cameron’s speech on the economy and points out that it’s fatally flawed, assuming it’s not deliberately mendacious. Stephanie Flanders notes that Cameron’s loose approach to the facts earned him a public slap-down from the OBR for misrepresenting them. That’s really very unusual indeed, as Wren-Lewis discusses in his follow-up post. 3. TNC on fine form in the NYT. Ta-Nehisi Coates is one of the best writers around on several topics. He’s particularly good at issues like this one. He cobmines the lived experience of the West Baltimore streets during the Crack Wars with a sharp analytical mind, an extensive self-education and a real touch for beautiful prose. He follows up the Times article with a further discussion in his regular Atlantic berth. In the 1920s and 1930s almost no-one was getting high in the US except Mexicans , a few Filipinos, and New York intellectuals who’d read some Jung. The American Medical Association used cannabis in a number of medical remedies, which according to the 1937 evidence of the AMA’s Doctor Woodward totalled about a third of those on the register: bear in mind that to this day, cannabis carries a Schedule 1 prohibtion, which defines it as ‘without recognised medical use’. Why did Anslinger pick such an obscure target? Well, he knew a guy who really, really didn’t like Mexicans. Rumour has it that Anslinger went to California in 1933 to speak to William Randolph ‘Citizen Kane’ Hearst, and that their unholy alliance was a genuine conspiracy (extreme versions include Mellon in the plot, presumeably because he was Anslinger’s father-in-law). I have never found useful evidence that this actually happened, but the historical record would have looked no different if it had. What we know for sure is that from some time in 1932 until the eventual Congressional hearings in 1937, Harry Anslinger campaigned relentlessly against a drug no-one else was interested in. Until W. R. Hearst employed his vast and dominant media empire in a propaganda campaign that is very nearly unmatched in American history. It is in this period that such ugly monstrosities as the movie Reefer Madness lurk. Hearst papers routinely described marijuana as causing hysterical, psychotic rages: “Hasheesh makes a murderer who kills for the love of killing out of the mildest mannered man who ever laughed at the idea that any habit could ever get him….” Anslinger’s allegation, repeated before Congress in 1937, that “Marihuana is an addictive drug which produces in its users insanity, criminality, and death”, was used in actual murder trials to gain acquitals. Even, in one case, of a murderer who hadn’t actually smoked the drug (his room-mate had some, and apparently sleeping in a room with a baggie in it had caused him to axe-murder some people). 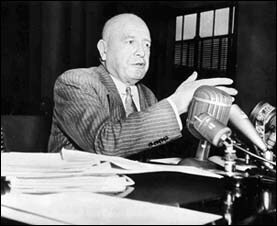 Anslinger had no reason to think that cannabis was dangerous. He had no science to back it up. There was no public health problem with cannabis, and there was no public outcry against the drug, because most people had never heard of it. It certainly wasn’t causing insanity, criminality and death. But Anslinger knew the Iron Law of Prohibitions: what he had was an Us and a Them. We, white America, didn’t smoke cannabis. They, Mexicans and other Latin-American immigrants, did smoke cannabis. And that’s all you need for a prohibition. Every single person who has ever written seriously about the national alcohol prohibition agrees on why it collapsed. Why? Because it violated the iron law of Prohibitions. What is the iron law of Prohibitions? Prohibitions are always enacted by US, to govern the conduct of THEM. The lies didn’t stop with Anslinger. As times evolved, he had to keep coming up with new strategies. Trying to justify a nation-wide raid targeted on black men, he said he was going to round up all the musicians; “Not good musicians, gentlemen, I mean jazz musicians!” In 1951, when a government physician testified that marijuana was not addictive, and that it did not, in point of fact, cause insanity, criminality and death (yes, the government has known that, for sure, since 1951) Anslinger invented the Gateway Drug argument on the spot, setting the pattern for Nancy Reagan’s contribution to the War on Teenagers in the 80s. The lies mutate over time (the current obsession is with the canard that mild marijuana use causes schizophrenia) but they never seem to stop. It is very hard to change someone’s mind when their salary depends on not changing it. And some Southern African-American communities. A good part of the Us & Them psychology of marijuana prohibition is class-based; cannabis is a drug for the poor. Without prohibition driving prices to quite frankly ridiculous levels, the drug is easy to grow for yourself, can be used alongside a hard-working life without trouble, and has good pain-killing properties which makes it very appealing to manual labourers and people who work long shifts in tight shoes. There’s a good reason why across the West, people whose lives consist of dangling from the poverty line smoke pot. In Jim Crow’s America, it is unsurprising that the Treme and Bourbon Street swiftly acquired the Mexicano habit; cannabis is a poor-people’s drug, a drug for the down-trodden which helps ease the pain.